We always seem to have citrus peels around here, lemon, lime, satsuma, grapefruit, etc. It seems such a shame to let such a wonderful and useful part of the fruit go to waste. Zest it and add it to salt or sugar. Leave the zest/sugar or salt mixture in a cabinet for a week or longer but give it a shake every day. Then you can add it to baking or cooking. Lemon sugar on top of shortbread or lemon salt as part of a salad dressing are particularly good. Steep the peels with a spent cinnamon stick or vanilla pod on the stove. This is a great air freshener. Use them in potpourri. Thinly slice the peels and lay them to dry in the sun or on a low oven until completely dried out. Then use as part of a potpourri mix. Critter deterrent. Critters don't like the smell of citrus so if you have critters (yes, new cat, you are included) mistaking your garden for the um, facilities then this will deter them from that area. Flavored vinegar. 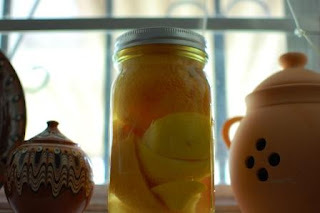 Fill a jar with the peels (no pith) and pour over white wine vinegar. Leave it in a cupboard for about 6 weeks and give it a shake when you think about it. Strain it and use it in salad dressings or cooking. Salted lemon peels. These are great for scrubbing the kitchen. I will pour salt on a spent lemon (cut side) and scrub the sink and around the faucet with it. Baking soda and lemon peels. I only use this on whites, but to scrub out a stain before throwing it in the wash, you can use the lemon (cut side) as a scrub brush on your stain. Flavor water. If you have juiced a lemon for a recipe, you can throw the peel in a water jug in the fridge and it will flavor the water. Candle holder. After you have juiced the fruit, fill the cavity with salt and press a tea light down in it. Garbage disposal freshener. Throw a peel down the garbage disposal and whizz it up. It will clean and freshen your disposal. Slug catcher. In England we had a tremendous slug problem and we tried everything to get rid of them including putting a hollowed out orange peel (cut side down) near my plants. The slugs go under the peel then you can, uh hem, dispose of them as you see fit. Compost. This is my tried and true with all plant based materials. I'm very intrigued by this critter repellent idea....since my not so new cats have decided that my dining room floor is the...facilities. =( Do you have safe suggestions for carpeted areas? Ms. Amanda, I have not had that problem (knock on wood) but...I have some thoughts: 1. put orange essential oil on a kleenex and leave it near the area 2. sprinkle dried peels around the area until they move along 3. put some fresh peels on plates around the area. I realize none of those options are particularly visually appealing, but it might solve the problem and it would only be temporary. Good luck and if you do find something that helps, let us know. Thanks! I will. I'm willing to try anything right now. My husband's about ready to give the kitties the boot! If you have multiple cats i have learned that some dont like to share the loo. Maybe try putting another kitty box somewhere and see if that helps. Also away from high traffic areas. Females and males mark their territory....its awful...and the smell is horrid. It never occurred to me to make extracts! That sounds like a fun gift idea. awesome post! will be using quite a few of these! Oh I love the disposal idea! Must try it! Thanks for sharing! Found you at WATH link up. Hope you will stop by and say hi! Please do try it. You can do the disposal idea even after doing some of the other options like the scrubber or stain remover.